An Auto transition scene is the most simple scene of all. In this scene type there are no interactive elements. Only after a clip of 360˚ video is fully played the trainee will be guided to a new scene. How does an Auto transition scene look in Virtual Reality? Since an Auto transition has no interactive elements, a trainee only sees the 360˚ video. Double-click anywhere on the canvas (or release your mouse when dragging an answer from another scene on the canvas) and select 'Auto transition' in the popup. Fill in a scene title and description. This is just for you and won't be shown to trainees. Since there are no interactive elements, you don't have to fill in anything else. 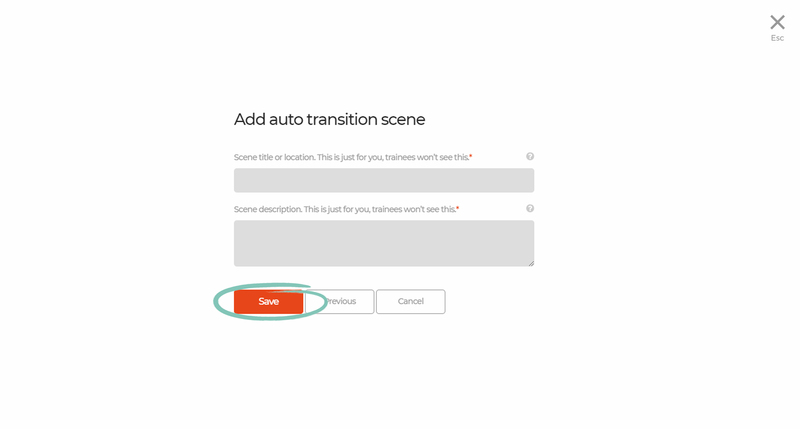 Click 'Save' to add your scene to the flow-diagram. Need more information about scenes in the flow-diagram?